But of course, their advice isn’t correct. I’m not a big fan of observational studies, but since the American Heart Association likes to cite them as evidence, here’s a conclusion several observational studies have reached: when people replace saturated fats with refined carbohydrates, their rate of heart disease goes up, not down. Clinical studies show that refined carbohydrates raise triglycerides, and high triglycerides at at least associated with heart disease, if not an actual cause. And yet for decades now, the AHA has been putting its stamp of approval on products like the ones shown below. Let’s look at the (ahem) nutrition in some of these heart-protecting foods. In a serving size that provides just 118 calories (boy, that’ll get you through the morning, won’t it? 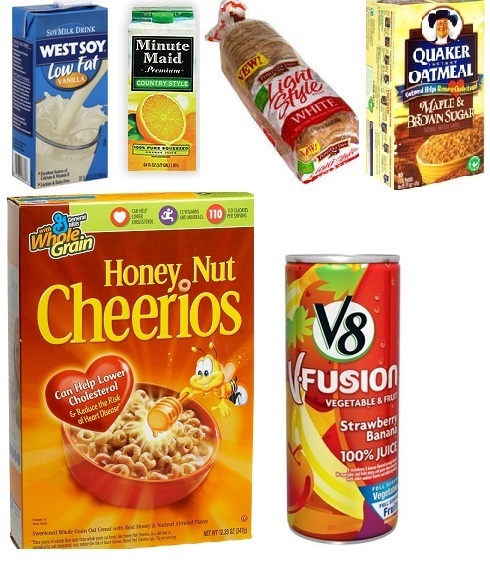 ), Honey Nut Cheerios contain 23 grams of refined carbohydrates. Almost 10 of those grams are pure sugar. A cup of West Soy vanilla soy milk contains 21 grams of carbohydrates, including 10 grams of sugar. The instant oatmeal contains 31 carbohydrates including 12 grams of sugar, and the V-8 fusion juice may as well be a Coca-Cola: 25 grams of sugar in one cup. So well-meaning people filling their grocery carts with products bearing the American Heart Association’s seal of approval could easily end up on a diet high in refined starches and sugars and think they’re doing their hearts a favor. I’m sure many have. The American Heart Association and its sister organizations have been spreading arterycloggingsaturatedfat! hysteria for decades – in effect, prosecuting the innocent. They’ve recommended processed vegetables oils instead of animal fats. They’ve taken very public positions warning people away from high-fat foods and promoting breads, cereals, pastas, juices, and other foods low in fat but high in carbohydrates. And of course, they think of themselves as the good guys.